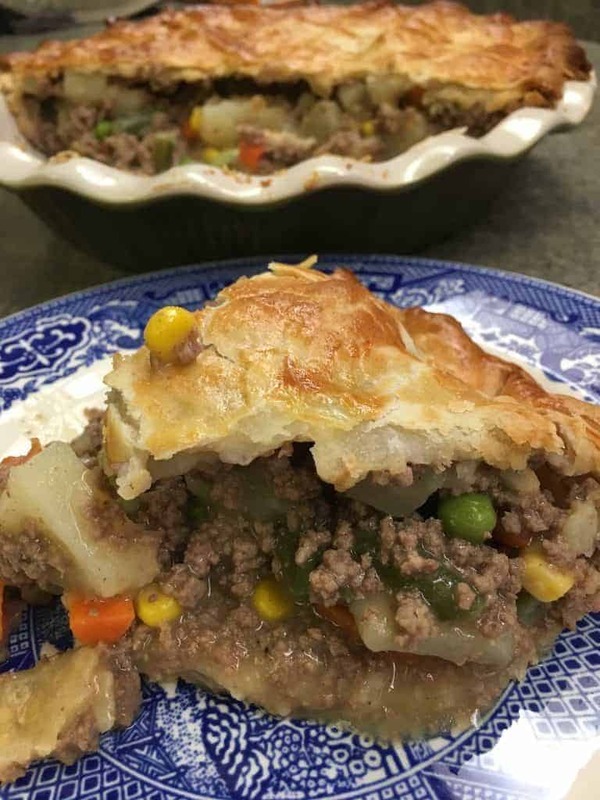 You’ll want to keep this Easy Ground Beef Pot Pie Recipe tucked away for those nights when you don’t have much time, or are too tired to cook. It’s an easy, hearty, and delicious meal that will feed the entire family. I love pot pies. It’s like a whole lotta goodness tucked into a neat little–or in this case big–package that’s easy to cook. It’s easy to make. It’s filling to eat. I ate a large piece, my husband ate three, and the kids each ate one piece and we still had leftovers. The great thing about the pot pie is that you don’t need to set aside a lot of time to prepare it. I cooked the beef and boiled the potatoes right before I opened the crust and rolled it out. But, you can also cook the potatoes the day before and refrigerate them until you are ready. And, you can cook the beef, freeze it, take it out of the freezer when you’re ready, thaw it, and then add it to the recipe. Don’t feel bad about using store bought pie crust, either. It saves A LOT of time. And, they are flaky and delicious. 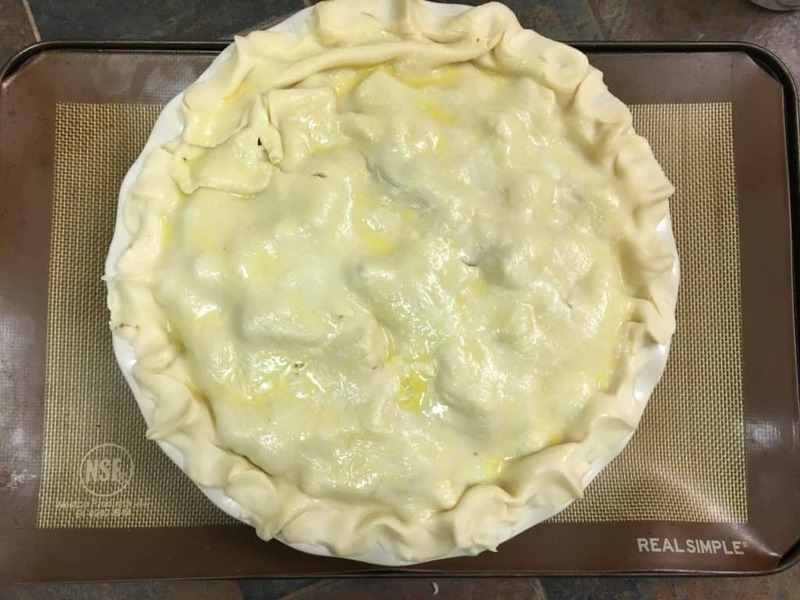 I bought two refrigerated pie crusts, that come in the package together, and unrolled the first one into a deep pie pan. You can see it’s not the prettiest sight, but it works, and that’s the objective. You can get a deep pie pan here. (The entire recipe and directions are at the bottom). 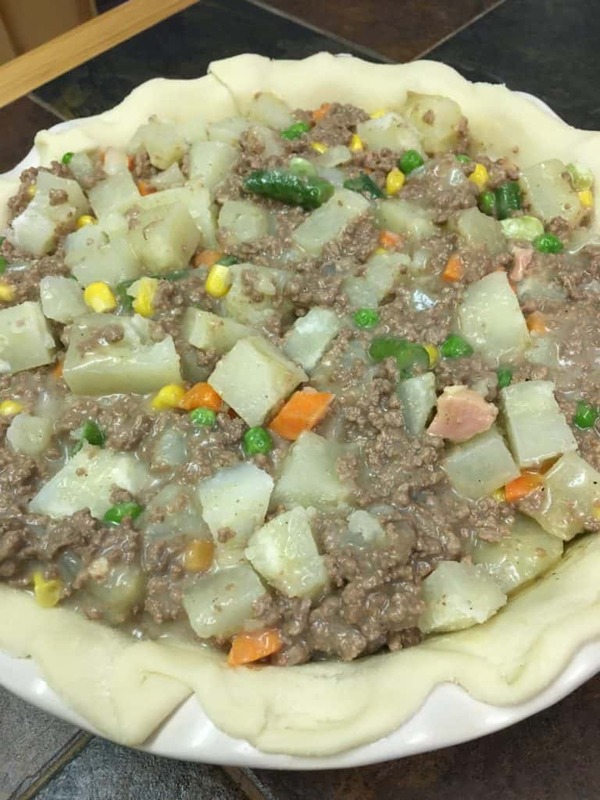 Once you’ve rolled out the pie crust, mix up the cooked beef, boiled potatoes, cream of chicken soup, and veggies (they can still be frozen) in a large bowl. Once you’ve mixed it all up, pour it into the pie crust. When I poured the mixture into the crust, I still had some potatoes left over, because I wasn’t sure if I had made too many. But, you can add everything on top, and it will only make the top of the pie crust larger. No big deal. So, go to town and add all those potatoes. I honestly don’t think you can ever have too many potatoes. Roll out the second pie crust on top. Pinch the top crust to the bottom crust to seal it. Don’t worry if you have a rip or two, or if it’s not pinched together as beautiful as Martha Stewart would do it. It’s still going to turn out amazing. We’re not aiming for perfection here, just dinner. Whisk one egg in a small bowl and brush it onto the top of the pie crust. That way, when you bake it the crust will be a golden flaky brown. My mouth is watering talking about it. Make a couple of small slits in the top to let steam escape. Put the pot pie on a tray, in case the insides decide to bubble over. You don’t want drippings messing up the oven. I’ve bought pot pies at the store and they were kind of wimpy pot pies. But, this one is stuffed with food, so your family will be quite full and happy, I promise. 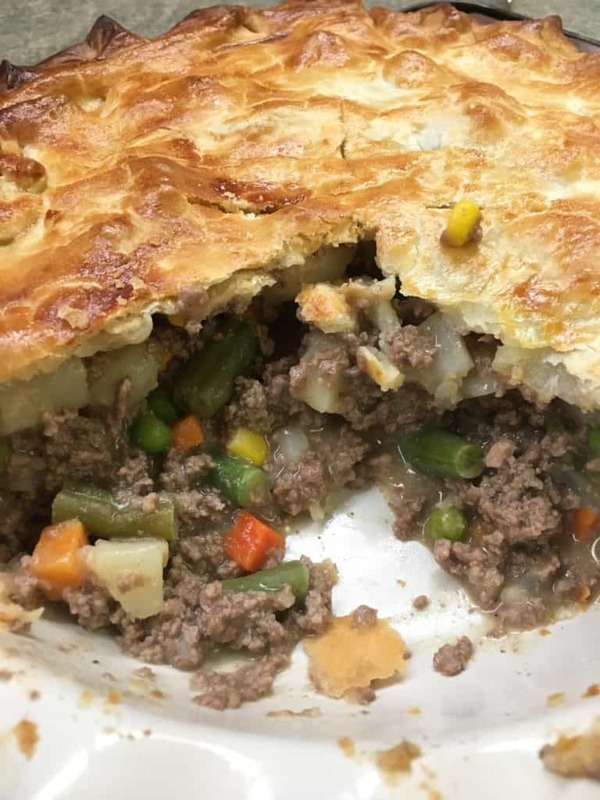 You can also prepare the pot pie and freeze it before you bake it. Make three or four at a time and have them at the ready on a night when you’re tired. When you’re out running around and want to come home and relax, knowing a pot pie is in the freezer and easy to cook, is a good feeling. The great thing about this meal is that you can also switch out the beef for cooked chicken. Let me know how yours turns out. I’d love to hear from you! 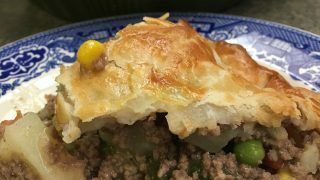 You'll want to keep this Easy Ground Beef Pot Pie Recipe tucked away for those nights when you don't have much time, or are too tired to cook. It's an easy, hearty, and delicious meal that will feed the entire family. Spray a deep pie pan with a non-stick spray, and set aside. In a separate bowl, combine cooked ground beef, cooked (or frozen) cubed potatoes, frozen veggies, cream of chicken soup, and salt and pepper. 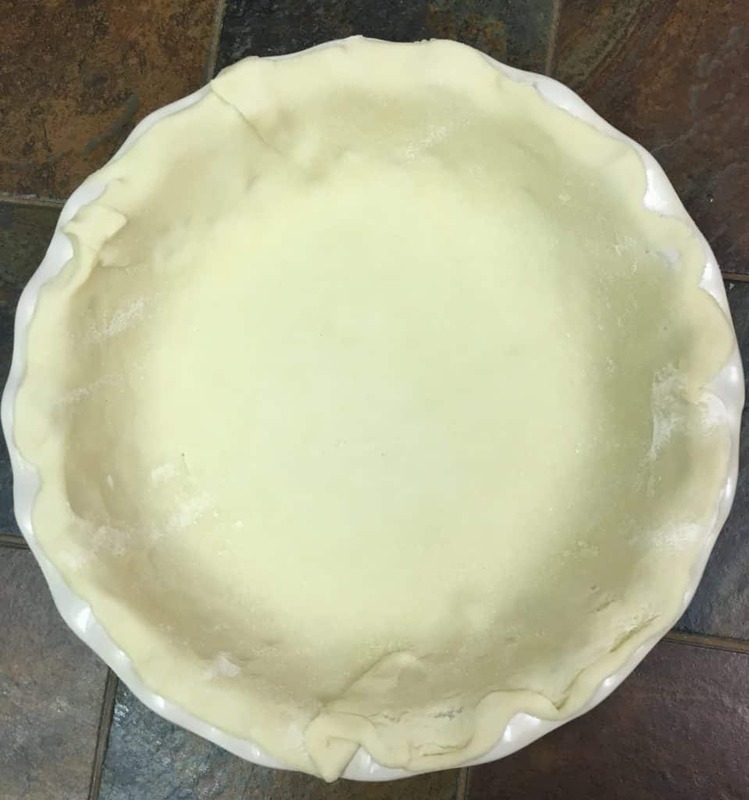 Roll out a pie crust in a deep pie pan. Pour the beef mixture over the pie crust. Roll out the second pie crust over the beef mixture and press it against the lower crust, creating a seal. Whisk one egg in a small bowl and brush the top of the pie crust. Cut several slits on the top of the pie crust. Cook for 30 minutes, or until crust is golden brown.
? Perfect Easy Delicious ! Sorry I didn’t see his comment sooner! Glad you liked it and thanks for stopping by!